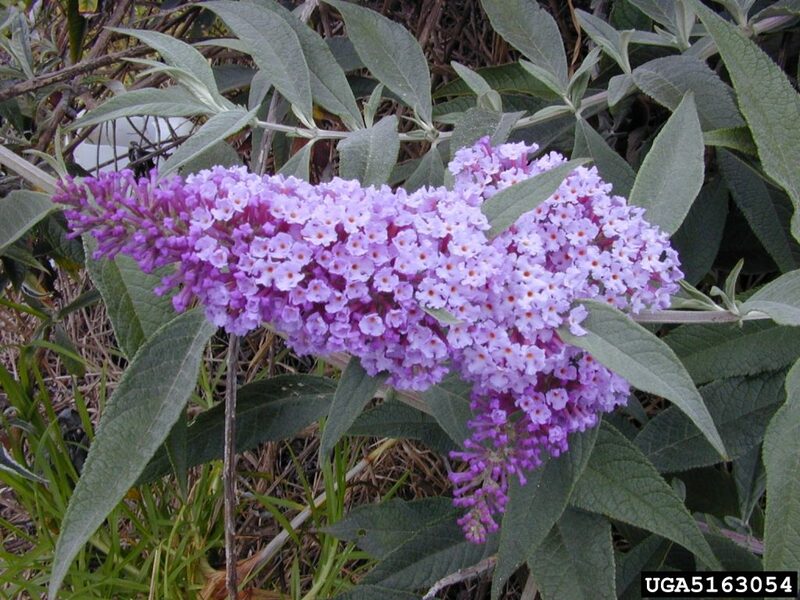 Buddleja davidii is a soft-wooded shrub, 2-4 m tall, branches elongate, arching, stems angled, white-hairy, 4-sided when young. 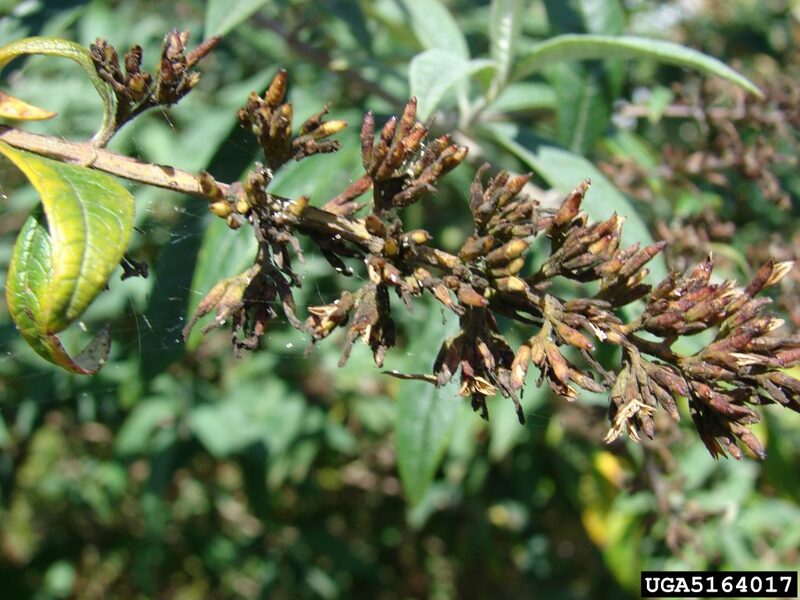 Leaves opposite, stalk to 0.5 cm long, blade 4-12 cm long, 0.3-7 cm wide, lance-shaped, pointed at both ends, dull gray-green, wooly below, dark green above, margin finely toothed, buds 2-scaled, gray-green (Dirr 1990). Buddleja davidii inflorescence. Forest and Kim Starr, Starr Environmental, Bugwood.org. licensed under a Creative Commons Attribution 3.0 License. (Accessed 11/2017). Flowers purple with orange center, tubular, 0.8-1.4 cm long, radially symmetrical, petal lobes 4, rounded, 0.2-0.3 cm long and wide; stamens arising from inside floral tube, ovary inflorescence of dense, elongate clusters 20-45 cm long, 2-5 cm wide, tapering to a point; blooms July-Sept; very attractive to butterflies and bees. 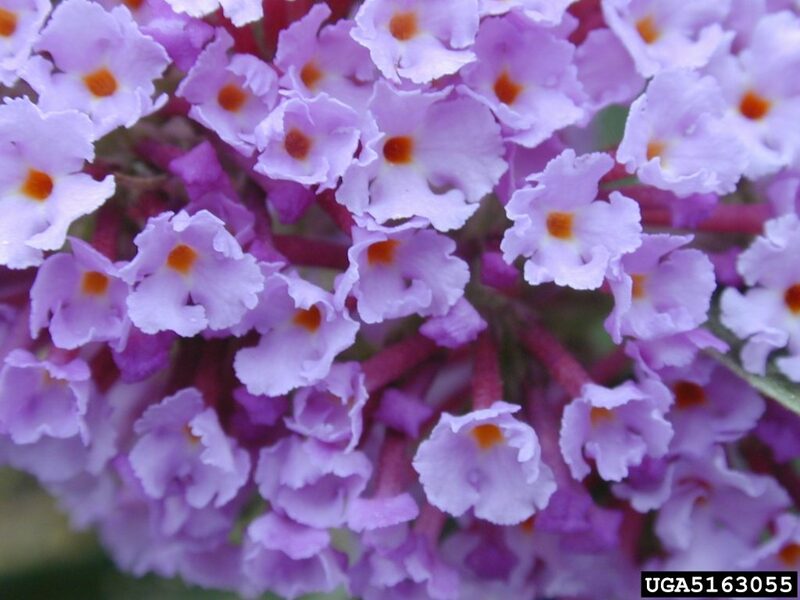 Buddleja davidii (butterflybush) flowers close-up. Forest and Kim Starr, Starr Environmental, Bugwood.org licensed under a Creative Commons Attribution 3.0 License. invasive.org (Accessed 11/2017). Fruit dry capsule, 0.5-0.9 cm long, with numerous winged seed 0.2-0.4 cm long; wind dispersed (USDA Forest Service 2006; Flora of China 2000). Buddleja davidii fruit. Forest and Kim Starr, Starr Environmental, Bugwood.org. licensed under a Creative Commons Attribution 3.0 License. invasive.org (Accessed 11/2017). Origin: China, Japan. Habitat: Escaped, in open uplands, edges of second growth woods in disturbed areas. Notes: Appears intolerant of shade. 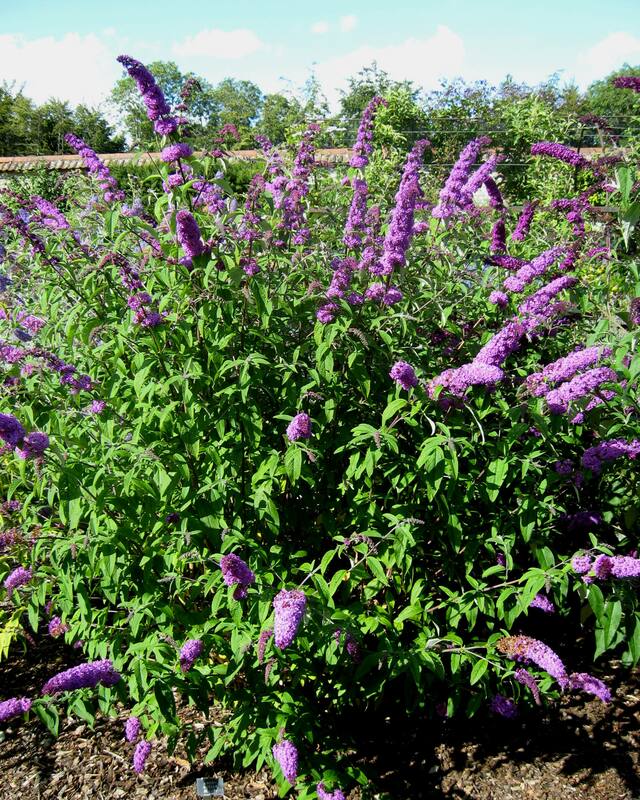 Buddleja is sometimes put into the family Loganiaceae (Flora of China 2000).